If there is one thing I have realised about little boys since experiencing one of my own, it is their love for anything and everything that has the potential to be either a little bit gross or scary. So when we were recently asked to put the new Zombe Blast toy through it's paces I decided that we should give it a whirl. Zombie Blast allows you to take part in your very own Zombie apocalypse.I was a little bit weary of how Leo may react to it. I knew that the fact it was a target game would go down pretty well, as the aim of the game is to shoot the Zombie until it's limbs come off and ultimately to stop it walking towards you. You have to shoot the Zombie down before your the time wraps up in around 30 seconds. You do this with the pistol provided, and you can shoot the walking Zombie from up to 2.5m away. There are 3 stages that you need to progress through, and each one becomes more difficult. Shoot him 3 times and one arm will blast off, shoot another 3 times and his other arm will detach, shoot him a further 3 times and he will die and fall over. It's actually really funny to watch and not gruesome in any way. The game is controlled by the pistol which has the 'on/off'' switch and of course the'start' button that sets up the games, If you aren't a fan of games that include zombies or guns, then this won't be the toy for you. We thought we would give t a whirl and see how we got on, and I think it has to be noted that the adults seemed to really enjoy this toy! Especially the 'grown up boys' i.e Dad's! Leo enjoyed the game but it has to be noted that he was a little bit scared of the zombie, even if he doesn't care to admit it. He was never the one to put the arms back on the zombie and tentatively waited for me to piece him back together again. That being said though, he was more than happy from a distance to use the pistol... Just as long as the zombie didn't get to close to comfort which is pretty understandable. 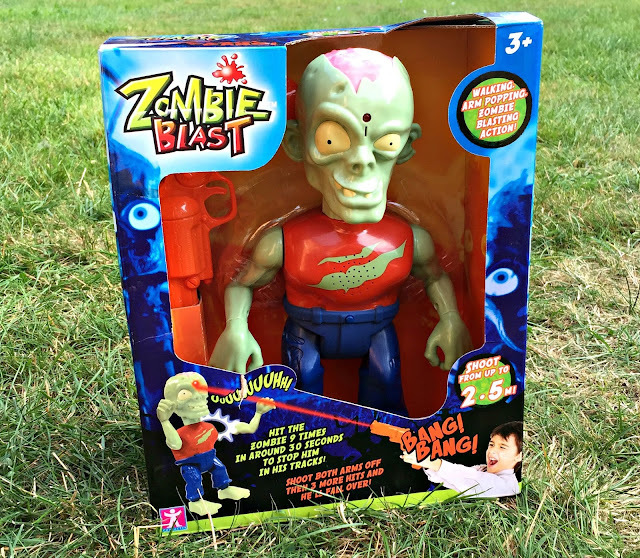 Zombie Blast retails at £24.99. Disclaimer: We were provided with a sample of Zombie Blast for the purpose of this honest review. All thoughts and opinions are those of Life Unexpected.